For decades parents have relied on carpets or overstimulating ‘puzzle mats’ to create a buffer between little explorers and the hard ground. Yet recent studies show you can never get all of the grime out of your carpet – no matter how many times you wash it – and cleaning every single edge of a puzzle mat takes time and effort you just don’t have! As parents, we didn’t want to sit on, or set little ones on a dusty, dirty, germy, allergen-packed floor or interlocking puzzle piece mat that collects germs in between every edge (talk about hours of needless cleaning!) so we created a ONE PIECE playmat that cleans down with a single swipe! We brought in the best graphic interior designers & nursery color psychology science before deciding on the perfect COLOR for our CLOUD play time mat. So unlike bright puzzle piece mats that are overstimulating, hard to keep together, and detract from your stylish space, Our Mats one-piece design is minimalistic and simple, so it ties into your décor and keeps baby safe without the headache. We know you’re a good parent and you want the best for your growing baby, this playmat is it. Bugaberry playmat is NON-TOXIC, LATEX-FREE, BPA-FREE, PVC-FREE, PHTHLATE-FREE, LEAD-FREE, FORMALDEHYDE-FREE, HVA-FREE plus NON-SLIP, NON-FLAMMABLE, SHOCK-ABSORBENT & THERMOGENIC. Add it to cart and take it home today. Discover how gorgeous and plush it truly is; you’ll love it, guaranteed or simply let us know and we’ll make it right. 100X BETTER THAN INTERLOCKING FOAM PUZZLE TILE PLAY MATS: MOMS say our .6" Thick ultra-plush LARGE SINGLE PIECE floor mat is 'better than' children's soft foam floor tiles because unlike multipiece mats ours provides a STABLE surface that WON'T SLIDE, WON'T BREAK APART & WON'T TRIP YOU as you and baby crawl, walk, skip or hop across it. Best of all, because it's one solid surface, you can spend hours playing with your infant, instead of wasting it cleaning puzzle edges. 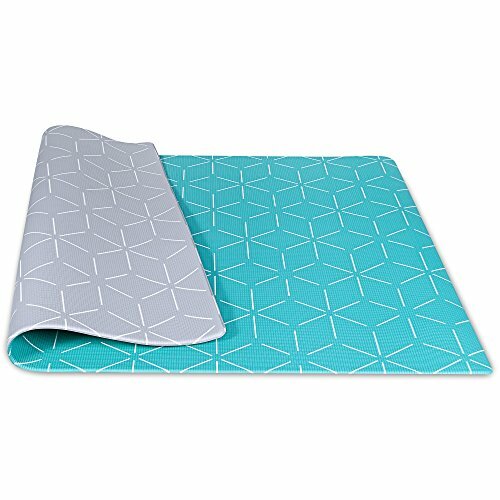 SAFEST DESIGN for BABY & HOME - 100% TOXIN-FREE PLAYMAT WORKS ON ALL of YOUR FLOORS: Because babies and toddlers seem to chew on everything we ensure that EVERY playmat is NON-TOXIC, LATEX-FREE, BPA-FREE, PVC-FREE, PHTHLATE-FREE, LEAD-FREE, FORMALDEHYDE-FREE, HVA-FREE plus NON-SLIP, NON-FLAMMABLE, SHOCK-ABSORBENT & THERMOGENIC - meaning it INSULATES YOUR CARPET, WOOD, TILE or any finish floor - keeping little ones cool in the summer and warm in the winter. EASIEST-to-CLEAN HYPOALLERGENIC TRAVEL PLAY MAT: You'd never intentionally set your infant or toddler on a dusty, dirty, allergen-packed floor, yet studies show that you can't get all the grime out of your carpet, and CLEANING BETWEEN EACH INTERLOCKING MAT PIECE TAKES HOURS! That's why we created our WATERPROOF MAT that cleans up in seconds with a wet cloth. Just to make your life easier we included a handy yet CHIC CANVAS TRAVEL BAG so you can keep your little explorer safe wherever you go! REINFORCED DURABILITY - 1 YEAR GUARANTEE: Baby will love 'growing up' on this play mat and you'll love how it's easier to clean than any carpet, blends beautifully with your décor, quickly rolls up for travel...and makes a fabulous yoga exercise mat. Bugaberry stands behind our promise that WE CONSIDERED EVERY FACET when designing this STYLISH playmat, and that you'll love every minute of your use, or simply reach out and we'll make it right - no questions asked. If you have any questions about this product by Bugaberry, contact us by completing and submitting the form below. If you are looking for a specif part number, please include it with your message.